The Vios Monitoring System is an FDA 510(k)* cleared wireless sensor internet of things (IoT) monitoring platform designed to optimize the management of patients throughout the continuum of care. Our solution is built on a medical-grade internet of things (IoT) framework and is designed to improve patient outcomes and reduce the cost of care. Together, the Vios Chest Sensor, Vios Bedside Monitor, and Vios Central Station Monitor enable continuous monitoring in any hospital environment, during intra-hospital patient transport, or where traditional in-patient monitoring systems are not deployed. Having a flexible sensor-based solution allows hospitals to meet patient throughput goals by triaging patients to lower acuity, lower cost environments and freeing up high acuity beds for those patients most in need. In the near future, Vios Medical will bring its Virtual Patient Care Services online which is staffed by highly experienced ECG monitoring technicians, and clinicians. 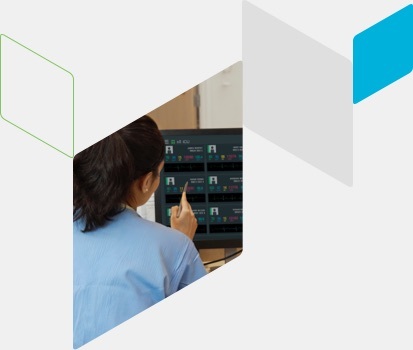 Our Managed Services Center leverages clinical data collected by our medical grade IoT solution to ease the burden of multiple patient data streams on the on-site clinical staff. We collect, process, and respond to patient physiological data allowing on-site clinical staff to focus on other aspects of patient care. thus intended to increase the productivity of your clinical workforce and reduce costs around equipment and labor. Our Virtual Patient Care Services Center is employed by US-certified ECG technicians and clinicians that have a wealth of experience in cardiac telemetry, and providing patient care at the bedside and remotely. Watch to learn more about how Vios Medical intends to drive the future of healthcare delivery through medical-grade IoT sensors and Virtual Patient Care Services. Disrupting a Fragmented, Inefficient, and Expensive System. 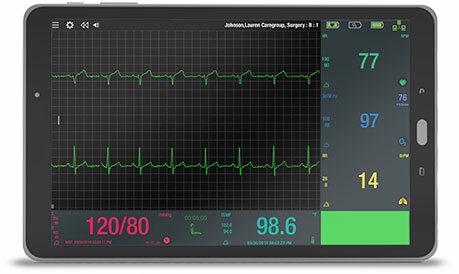 The Vios Monitoring System can help reduce healthcare costs, increase productivity, drive efficiency and improve the quality of care for patients. Our medical-grade IoT platform acquires physiological patient data in a wireless, comfortable form factor, allowing for real-time management of the patient anywhere throughout the continuum of care. 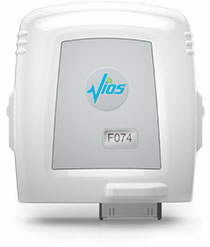 The Vios Chest Sensor is an FDA 510(k)* cleared class II medical device that allows for continuous collection of a patient’s physiological vital signs data. The chest sensor collects 7-lead ECG, heart rate, respiratory rate, oxygen saturation, non-invasive blood pressure, temperature, pulse rate and patient posture and ambulation data. 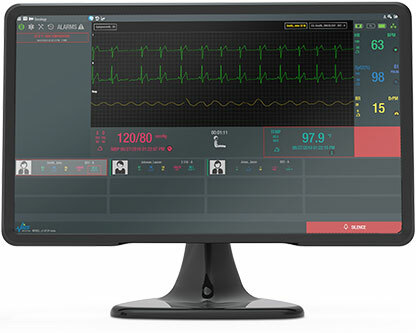 The Vios Bedside Monitor is an FDA 510(k)* cleared class II medical device that receives, analyzes, and displays physiological vital signs data via Bluetooth from the Vios Chest Sensor or other wireless medical-grade peripheral devices, such as a wireless NIBP cuff. The BSM runs proprietary algorithms that can alarm for various cardiac arrhythmia and vital thresholds. The Vios Central Station Monitor* Software allows for browser-based remote viewing of all patients in a centralized dashboard view. The CSM allows for monitoring of up to 48 patients in various wards spanning from low- to high-acuity environments. The CSM can be run on a pre-specified computer or laptop, thereby allowing clinicians to monitor and manage patients remotely. Additionally, the CSM includes several software modules designed to aid in the clinical decision support process. In the near future, our Managed Services Center will take the burden of consuming, analyzing, and responding to patient physiological data off of the on-site clinical staff therefore allowing them to focus on other aspects of patient care. Additionally, our services center will make it possible for patient data to be continuously monitored in any hospital environment, including the home. Clinicians are notified of critical events or changes in a patient’s status through pre-defined protocols set forth by the attending physician and care team. Through the utilization of our managed services center, we intend to enhance clinical workforce productivity, increase patient safety, and dramatically reduce the cost of workforce labor. When compared simultaneously, clinicians and patients alike prefer the wireless VMS solution over legacy monitoring solutions.